Macy, NE – In a joint collaboration between the Umonhon Nation Public School and the Omaha Tribal Historical Research Project (OTHRP), a permanent display of historic photographs featuring Omaha tribal members and scenes of local interest has been installed throughout the hallways and Circle area at the School. The exhibit includes 29 enlarged images gleaned by OTHRP from museums as far away as Hampton Institute in Virginia, the archives of the Nebraska State Historical Society, the Foster Webster Collection and from other local private collections. The photographs depict the transition era of the late 19th and early 20th Centuries. Winona Caramony, former School Board Member and current OTHRP Board Member as well as a recognized authority on the Umonhon language was on hand to watch the installation. “It is fun to see folks I know in these pictures,” she remarked as she started naming some of the 1946 graduates. Mrs. Caramony is Mr. Hasting’s adopted mother whose encouragement when he was a child not only kept him on his journey in school through his Master’s Degree but also influenced his choice of field of study -- Anthropology. The project, the market value of which is nearly $25,000, was completed with the cooperation of several institutions, including the Hampton Institute in Virginia, the Nebraska State Historical Society of Lincoln, Nebraska, and a commercial frame shop also located in Lincoln, the latter two approaching the contracted task with such enthusiasm that prices were cut and services donated to bring the actual cost down. Both the Society and frame shop donated their time and scanning expertise – valued at about $1,500 each – and expert computer artists from the Society Photography’s Department also provided discount rates while delivering museum-quality work which will last at least 50 years – a $2,000 value. OTHRP donated two weeks of its professional staff time to travel to Lincoln in order to chose pictures from the Society’s archives as well as sifting through OTHRP’s own files for some suitable images, research work worth $2,100. Historic photographs of museum quality are generally worth $250 each, double for images of specific significance such as Native cultural groups, doubled again for rarity, so conservatively, the market value of the 29 photographs is about $14,500. The actual cost to the school for the entire endeavor was $3,000. Funding was provided to Umonhon Nation Public Schools through a mini-grant awarded from Educational Service Unit One of Wakefield, Nebraska, part of a statewide administrative network set up to coordinate curriculum materials and limited monies for special projects such as the cultural display to individual school districts. Mrs. Stone, a staff member at the school, wrote the winning grant for the project. The mini-grant also allowed for construction of a Tribal mosaic placed over the entrance of the new building; a five-foot glass display case built by the Nebraska State Historical Society to contain Omaha cultural items; a series of drums to be built by students, and funds for a community pow-wow, musical instruments for the school band, faculty attendance at workshops, and curriculum materials for the school’s Special Education Department. The project continues a series of local efforts in “bringing history to life for the future” provided to the local tribal community in recent years by OTHRP, including a similar photographic exhibit on permanent display at the Carl T. Curtis Health Education Center, an outpatient medical facility. As the official cultural, educational and research organization for the Omaha Tribe of Nebraska and Iowa, OTHRP is committed to continuing to work with the tribal community in expanding the photograph project to other facilities. A second addition to the School Collection is planned by OTHRP to be exhibited in a special hall of honor, displaying the early students who successfully traveled from the Presbyterian Mission School to Hampton Institute, and will include traditionally educated medicine women whose expert knowledge served the tribe in many ways. Western botany classification has changed since Gilmore’s day. Not all of the plants he found have been identified under the current system. Therefore readers should not use this guide as a field guide. Any wild plants should be identified by an expert before eaten. For example the classification Agaricaceae contains both poisonous and eatable mushrooms. The difference between the types may be small such as the time of year that they are found but the physical reaction is not. One may be poisonous while the other is fine to eat. — Melvin Gilmore, Uses of Plants by the Indians of the Missouri River Region, 33rd Annual Report of the Bureau of American Ethnology, 1919. Omaha Tribal Historical Research Project, Inc., is a non-profit, 501(c)(3) educational and charitable organization registered in the State of Nebraska. Program and financial information can be received by sending a note or letter, along with a self-addressed, stamped envelope to OTHRP, or by contacting the Secretary of State, State of Nebraska, P.O. Box 94608 Lincoln, Nebraska 68509, where such records are also on file. When Lewis and Clark's military expedition, the Corps of Discovery, came up the Missouri River in 1804 and met in late July with the Otoe/Missouri Indigenous nations near where what later was to be known as Council Bluffs, Iowa (a "first" encounter with Aboriginal cultures by the Corps, and thereby considered by the national organizers of the Lewis and Clark Bicentennial as one of 15 so-called "signature events" for the 2004-2006 celebration), the explorers were told by the local Natives that they should be meeting instead with the Omaha. A week later, when the expedition came upon the Main Village of the Omaha, they did not find them at home. The Omaha were engaged at the time in their annual Buffalo Hunt, and only a few warriors, the elderly, and small children and their mothers were present in the Village. As it was well known among the local Indigenous nations that the Omaha, upon conclusion of their Buffalo Hunt, held an annual He'dewachi (Harvest Celebration) administered in a sacred manner by the returning He'thruska (Warriors), it is from this time that what was later to be called in its secular form the "pow-wow" - now universally performed across the country and around the world - came for the first time into common knowledge of the Indo-European/American. The melodies and harmonies of a number of songs used today in worldly competitions are drawn from those originally composed by the Omaha and their forebears for use in sacred practice during the ancient He'dewachi. Thus, from an Aboriginal perspective, it can be said that an even MORE "significant event" than the expedition's meeting with the Otoe/Missouri was the "discovery" by Lewis and Clark of the modern Native Pow-Wow, which also observes its own "Bicentennial" with a ten-day celebration of the 200th Omaha He'dewachi in August, 2004. Yet even today, the "Corps of Discovery II" marketing ploy begun in 1978 with formation of the national Lewis and Clark Bicentennial Commission still seems to think that the Omaha "are not at home." Attempts by OTHRP to date to publish from the Omaha point of view, a position paper on that epic journey in major print publications in the United States have so far fallen "on deaf ears." Meanwhile, both newspapers and magazines, as well as academic journals and publishers continue to peddle Indo-European/American-derived, ethnocentric drivel that proclaims authenticity in quoting liberally from the "definitive" editions of the Journals and related post-expedition documents yet persists to misinterpret and/or often simply ignores, again when seen from the Indigenous perspective, more accurate assessments of the historic record referred to therein. With Pierre Cruzatte and François LaBiche: An Omaha Point of View, OTHRP is providing such an assessment. The following paragraphs are excerpts from this important article, offering a general overview of the preparatory nature of who these two men were, and of their fundamental contribution to the success of the expedition. "Pierre Cruzatte and François LaBiche were commissioned as a regular part of the army that accompanied Lewis and Clark on their famous "Corps of Discovery" expedition. They were hired on for their skills at tracking, boating and speaking multiple languages. Their knowledge of the Missouri River from the Omaha lands up to where the Mandan lived, where the expedition met Sacajawea, made the journey possible. Their language skills provided the practical foundation for Sacajawea to communicate beyond her Sioux/French husband and her own people. Pierre Cruzatte (Curzat, Crusatte, Crouzatt, Croisette) enlisted with Lewis and Clark on May 16, 1804 at St. Charles (Missouri). Cruzatte had been a trader on the Missouri River for the Chouteau fur interests. He was apparently a small man who had but one eye and was nearsighted in it. He was an expert boatman and knew the Missouri well. He played the fiddle, which entertained not only the expedition but also the Native Americans along the way. Cruzatte would play and the men would dance, often with the accompaniment of a “Tambereen & a Sounden Horn” (tin, with a brass reed). François (William) LaBiche (LaBuche, LaBeiche, LaBuish) joined the Corps of Discovery on November 28, 1803 at Kaskaskia, Illinois. LaBiche may have been a nickname meaning “the doe” or in another spelling LaBuche, “the log”, with his real family name being Milhomme. He seemed to be used primarily for his woodsman skills and secondarily as a boatman, often assisting Cruzatte. 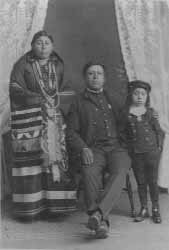 LaBiche’s proficiency at languages allowed him to translate English into French for Charbonneau, who then would translate it into Hidatsa for Sacajawea, who finally translated it into Shoshoni during their time with her home tribe. After the expedition, LaBiche along with John Ordway was put in charge of transporting the scientific evidence to Washington D.C.
Cruzatte is said to have been linguistically proficient in at least three spoken languages: Omaha, French, and English, in addition to speaking “a little Sioux” and thus by definition, skilled as an interpreter in communicating cross-culturally. He probably was also proficient at Sign Language. According to Steven E. Ambrose in his book Undaunted Courage, LaBiche actually knew “several Indian languages.” LaBiche spoke French, English, Omaha and several lower Missouri Indian languages, which may have been those of the five cognate tribes of the Omaha or others. LaBiche is mentioned as an interpreter, and it is speculated that he would have either assisted Cruzatte, or been called upon singly from time to time by Lewis and Clark. Certainly the roster lists them both as interpreters. Raised among the Omaha, both men, as young boys, certainly must have accompanied the tribe on its annual summer buffalo hunts, the most important single outing of the tribe. This educational practice would have given them the knowledge and experience of who was who upon the plains, living off of the prairie, and who was either friend or foe of their people, as well as data about the nature of rivers, since the Omaha were close followers of the Missouri itself along with the prairie, which is criss-crossed with smaller rivers. Both men were active during the years of the fur trade, a major industry of the day, following in the footsteps of their respective fathers. As most of the fur trade at this time in this part of the Continent was conducted by the French and with the Omaha virtually in control of the Missouri River during these years, fur trading taking up by young men such as Cruzatte and LaBiche would have been a logical choice. Their backgrounds are so similar that it is most likely they knew each other, did trapping and fur trading together from time to time, and LaBiche may have encouraged Cruzatte to join the expedition. In the recorded history of the expedition it is mentioned that Cruzatte was also an excellent navigator, boatman and waterman, who often averted accidents on the Missouri River by avoiding, to the untrained eye, hidden sandbars and other obstacles offered by the wild Missouri while traveling upstream. LaBiche must have been a good boatman as well. For this reason alone it is logical to assume that both men grew up along the Missouri River, learning its pathway as a normal part of an Omaha education. Despite being considered a Plains Indian tribe, the Omaha were equally experienced at navigating the river both up and downstream, using round bull-boats made of skin. It is reported that often both Cruzatte and LaBiche, working together, would be placed in charge of the expedition’s vessels by Lewis and Clark. Cruzatte worked as bowman on the keelboat because of his ability to spot the slack water eddies that would help move the boat upstream. Once, Charbonneau froze at the helm during a sudden squall which threatened to capsize the boat instead of putting “her before the wind,” causing the boat to dangerously keel over to one side. Cruzatte saved the situation and the Corp’s written records by threatening to shoot Charbonneau if he didn’t take the helm and turn the boat properly. As for LaBiche, according to Ambrose’s Undaunted Courage, he was always among smaller scouting parties made up of at least four company members. Ambrose also reports that LaBiche was part of the search party that looked for and returned the known deserter, Private Moses B. Reed (Read), back in 1805. Being included in this manner, it can be deduced that LaBiche must have been expert at tracking with a keen ability to read the land. Again, looking at the necessity of economy, only those who possessed the skills necessary to carry out certain actions would have been assigned to do them. As LaBiche seemed to have always been part of these small forays, can it not be assumed because of this fact that he was the prime tracker, as was Cruzatte given the responsibility of being the prime boatman? The story of Cruzatte or LaBiche is a curious one for Native scholars. While the Omaha have never gone to war against the Euro-American invasion of their lands, the role of those the French have labeled Métis, or half-bloods, were not necessarily in the best interests of their Native full-blood brothers. What would have happened to Lewis and Clark without the help of these men? How did the Omaha of those times truly regard them? We will never know. It was the tenor of the times that underplayed any American Indians’ role in such an undertaking; naturally in those early decades all credit would be given only to Lewis and Clark, but two centuries later the story of Cruzatte and LaBiche as told by the people among whom they were raised is, in fact, a more accurate report on those significant aspects that are missing in today’s popular culture around this historic event." Pierre Cruzatte and François LaBiche: An Omaha Point of View also describes at length, the broader circumstances in what may have actually occurred with the expedition during its encounter with the Teton Sioux in September, 1804, an account that has heretofore not been given its proper Native perspective in American history. Among other things the article provides new material on the circumstances of Sacajawea, gives insight into the role of alcohol in early American/Indigenous relations, and reveals the incident when Cruzatte shot Meriwether Lewis in the upper thigh or buttocks by Cruzatte while on a hunting expedition of August 11, 1906 "to be not what it seems." Individuals interested in receiving a copy of the full, unpublished article may do so through the TRADING POST section of this site. Editors who may wish to consider the manuscript for publication may contact OTHRP directly. "Keep your head above water, and smile and laugh as much as you can about life"
Dennis Hastings, OTHRP's Founder/Director, is featured in a chapter of Rags to Retirement, the newest book of husband and wife authors Gail Liberman and Alan Lavine, veteran financial journalists who wrote the best-seller Rags to Riches (Dearborn Trade Publishing, 2000) and other works. Liberman and Lavine describe Hastings as having perhaps "...the toughest retirement story of anyone in this book," as they go on to enlighten the reader about Hastings' youth in government boarding schools, years of activism in the Native American community, and later, a life of research scholarship and accomplishment through his commitment to the Omaha People and the formation and continuance of OTHRP. "(H)e accomplish(ed) something almost unheard of for a person of his background," the authors relate, "(by) obtain(ing) a Master's degree in anthropology at the Western Institute for Social Research...(and) co-author(ing) a book with Robin Ridington, Blessings for a Long Time (University of Nebraska Press, 1997)...(while) attempting to raise money to build a landmark museum for his tribe." In their new book, Liberman and Lavine feature 12 people who found ways to meet their retirement goals without sizable nest eggs by taking the initiative to implement unconventional strategies. The journalists provide as examples a synopsis of each person's particular life circumstances and how they dealt with them, then offer specific ideas for readers to consider were they too, to be faced with formidable obstacles toward living comfortably in their elder years. "(My income) doesn't meet expenses, but I keep doing things," the authors quote Hastings. "Say I needed a car payment. I don't buy lavish cars. I do a contract and wait for that money to get here and pay it off. The creditors are very mad at me. By the time the year's ended, they're not so mad." Liberman and Lavine subtitled their chapter on Hastings, "Native American Anthropologist Beating Stroke," only the second mention of this debilitating ailment of his in print (the first was a feature article by Fergus Bordewich in the January-Feburary, 2003 issue of My Generation, a late publication of the American Association of Retired Persons), a period of his life that the authors reflect "...Dennis doesn't like to talk much about..."
It is a tribute to Hastings' determination and vision of OTHRP that he continues to serve the organization that he founded thirty years ago under such circumstances. As syndicated columnists, Liberman and Lavine's articles appear in the Boston Herald, Palm Beach Daily News, Pittsburgh Post-Gazette, and Scripps Howard newspapers. Their work has been featured or quoted in The Wall Street Journal, The New York Times, Money, Redbook, and Bloomberg. A museum for the people, built by the people to house the artifacts and sacred items taken from the people over a century ago. Help right a historic wrong by being a part of the return of a culture, make a donation with or without a purchase.